The discussion is continuing in the Downtown retail: struggling, thriving, searching message thread (now up to 86 comments as of tonight). 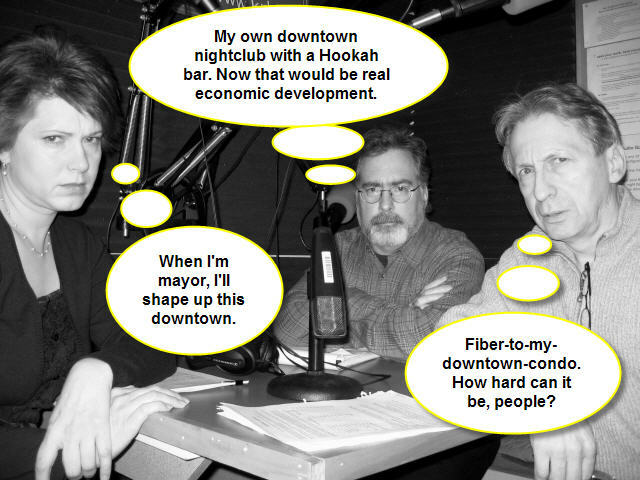 And with more downtown-related discussion on tap at next week’s NDDC downtown forum, the three of us tried to make sense of it all today. We failed miserably, and got a little grouchy. Click play to listen. 32 minutes. Oooohhh…..”localized groans” – Locally Grown – I get it! P.S. I have no interest in being mayor. Can I say something funnier? I know you have no interest being mayor, Tracy, but you’d be a good one, even when grouchy! But sure, cook up another quote and I’ll swap it out. Great podcast! I’ll add just a few points. Since I opened in July, internet sales have been 20% of my business. 40% in Jan. due to the drop off in walk-in business. Internet sales supplement my walk-in business, not the other way around. That may change as internet sales grow. 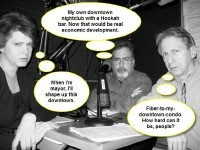 Downtown is part of my plan. The store is not a place to store my books for the internet. I could find cheaper space if that is what I want to do and I may someday, but for now I think I can make a go of it on Division st. I made changes to the business from its previous incarnation to attract more walk-in traffic, comfortable seating, readings, book signings etc. I advertise in the Northfield News, Carletonian, Manitou Messenger. Mathius thought it seemed odd to have a used bookstore in Northfield. Where other than a college town would a used bookstore do well? My market research led me to believe a used bookstore could only survive in a college town. I went to school in Madison WI, which may have more used bookstores per capita than anywhere. One problem with radio is that you canâ€™t see the commentatorsâ€™ expressions. In yesterdayâ€™s podcast, I wish you could have seen Carleton student Mathius Bellâ€™s expression when he commented on developers who built beyond the student bodyâ€™s walking range. I interpreted it to indicate that he was wondering why someone would leave that much money on the table. Students may seem suprised that more businesses don’t open near campus. I’ll just mention this. In my 7 years at St. Olaf, I had students complain about the price of poster board, $1.00. Target sells it for $.50 They would drive to Target to save $.50. They bought ipods at Target even though the bookstore price was the same. Everyone falls into that marketing trap that chains are cheaper. For me to be successful downtown, I believe I need to offer the best selection, service, price and overall value to my customers. I am an optimist that it can be done.